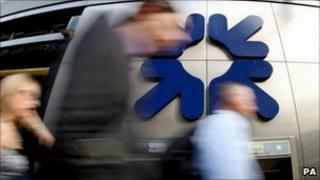 Royal Bank of Scotland (RBS) has given details of the amount that it paid its top people in 2010. The bank announced that it paid a total of £375m to 323 people designated as "code" or key staff. RBS, 83%-owned by the taxpayer after a government bail-out in 2008, made a £1.67bn loss in 2010, after losses of £3.6bn in 2009 and £35bn in 2008. RBS has already disclosed that chief executive Stephen Hester received a pay package worth £7.7m for 2010. Mr Hester said in the bank's annual report that its recovery was "ahead of schedule", highlighting the fact that the bank had returned to operating profit. Before restructuring costs, strategic disposals, bonus tax, fair value changes and a host of other exclusions, this operating profit came in at £1.9bn. "We have much work still to do and there are significant obstacles still to overcome," Mr Hester warned. The BBC's business editor, Robert Peston, points out that the "code" staff, as defined under rules set by the Financial Services Authority, earned, on average, £1.2m each. They are those executives who are perceived to do things that have a bearing on the risks that banks takes. However, he adds that this definition excludes other RBS staff, such as traders, who earned even more than this. "For what it's worth, RBS's code staff earn less than Barclays' code staff, whose average pay was £2.4m per head," our business editor adds. "So presumably the chancellor of the exchequer will point to this disparity as proof that taxpayer-owned RBS is showing restraint." Although the RBS pay undercut Barclays' figure, it was higher than that of HSBC, which said it paid 280 staff an average of just over £1m each. Banks have been releasing this information in accordance with new EU rules on disclosure of remuneration. Publication of the figures also follows the banking sector's Project Merlin agreement with the UK government, aimed at curbing high pay and boosting bank lending.